There are many earth-moving vehicles and heavy equipment that have recently made news headlines; this is because improper handling and general negligence has led to numerous work-related injuries and deaths. As such, it is imperative that all employees obtain the proper safety tips and guidelines required to maximize worker safety. Both seasoned veterans and rookies need to learn how to properly handle heavy equipment before operation, as accidents can happen to anyone. 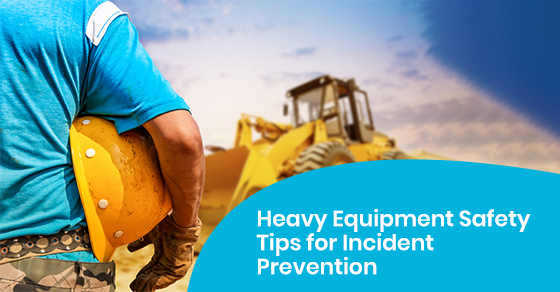 Here, we break down the top heavy equipment safety tips for incident prevention. First and foremost, a heavy equipment operator must check their blind spot thoroughly before moving their vehicle. They must be absolutely certain that no one is behind their vehicle as well. If they are not sure, they should take the time to get out of their vehicle to inspect the area. Furthermore, if their vision is obstructed for whatever reason, they should also ask a spotter for help. The spotter will direct and guide the driver and should do so from a safe distance. It should also be mandatory that all workers have on their high visibility vests any time they are on the construction site. Workers should always be in contact with the people that are working in their vicinity. Workers aren’t mind readers, and having a two-way radio handy is ideal for easy communication with fellow employees. If, however, they are unable to procure a two-way radio then employ the services of a highly trained spotter so that they can use hand signals to communicate effectively. Moreover, safety meetings should be seen as an opportunity for workers to discuss how to best communicate with their fellow operators, and the appropriate protocols should be reinforced by the foreman working on the construction site. Many people assume that they will be safe and sound inside a well-fortified heavy equipment vehicle. However, wearing a seatbelt is just as important in a heavy equipment truck as it is in a conventional vehicle. The only possible excuse for not wearing a seatbelt in a heavy equipment machine is pure negligence. Having a seatbelt on will ensure that the worker is safely held in their seat when moving over rough terrain. They will also be saved in the event of a rollover, which happens more often than people assume. At the end of the day wearing a seatbelt when operating a heavy equipment machine will reduce the number of close calls and save energy after a hard day of work on a construction site. According to many safety departments, including the OSHA, the most prevalent causes of accidents include stepping off and on of heavy equipment, with falls also being frequently reported by injured workers. As such, workers should take the time to properly exit and enter the cab of a vehicle. They should also avoid jumping from the vehicle, even if they are feeling confident about their dismount. In addition, they should try and maintain a 3-point contact when they mount or dismount from their vehicle. For those unaware, the 3-point rule requires that the worker maintain 3 points of contact with their equipment at all times. For instance, one of their hands and both of their feet, or both of their hands and one of their feet. Furthermore, any steps or handholds that need to be repaired should be taken care off as soon as possible. Replacing damaged materials can prevent accidents over time. Workers should always remain on level ground when they are unloading or loading materials from their equipment. Otherwise, they may slide off the low-bed ramps and injure themselves, or roll over and have a fatal accident. Sometimes a worker may be required to unload their machine in a high traffic area or chaotic worksite. However, this is no excuse to be haphazard or negligent, and workers at a busy construction site should ask a spotter to guide them and make certain that workers are clear of the unloading vicinity before they unload their items. Before construction work transpires the construction site needs to be properly assessed for any overhead or underground hazards. Overhead obstructions, which may include low clearance and power lines should be taken care of immediately. The appropriate departments must be called into action so that they can mark underground utilities, which may include electrical, sewer, water and gas, with paint that is colour-coded. Moreover, when the worker has arrived near the underground utility in question they should play it safe and hand dig in order to uncover items. Snow fencing and sturdy barriers should also be erected around dugout holes, as civilians or workers can fall into them otherwise. Even workers who have been operating heavy equipment for decades can become exhausted and stressed out from time to time. If a worker is feeling overwhelmed or uncomfortable with a given task, they should not be forced to perform the assigned task. For instance, if a worker feels wary about working near a hazardous zone or on a slope, they should exit the vehicle and carefully inspect the area before proceeding. It is ideal to stay calm and collected while working to maximize productivity and reduce the risk of serious injury or death. A calm and focused worker can lead by example and help promote a safe, cooperative environment that benefits all those involved. In sum, please note that the aforementioned heavy equipment safety tips should be taken as a general guideline, and may need to be modified or supplemented depending on a given project. Moreover, holding routine safety meetings and ensuring that the latest safety protocols are enforced will reduce the risk of injuries at any heavy equipment jobsite. For more information and tips regarding heavy equipment safety, call Truck Loan Center at 1-866-230-0094 or contact us here.